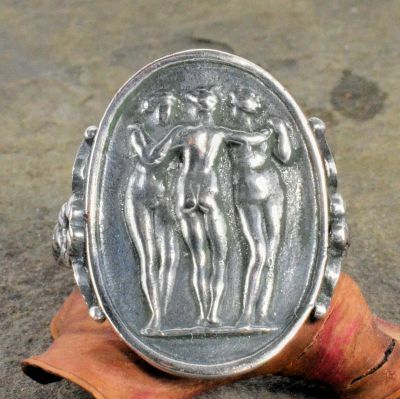 Description: A Victorian designed sterling silver mythological 'the three graces' ring. 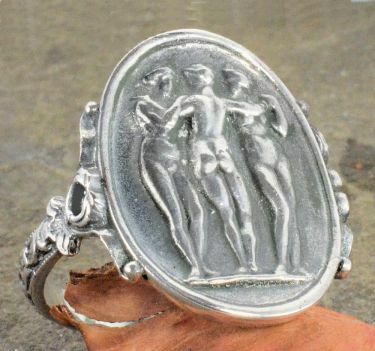 In Greek mythology, the three goddesses of joy, charm, and beauty. The daughters of the god Zeus and the nymph Eurynome, they were named Aglaia (Splendor), Euphrosyne (Mirth), and Thalia (Good Cheer). The Graces presided over banquets, dances, and all other pleasurable social events, and brought joy and goodwill to both gods and mortals. They were the special attendants of the divinities of love and together with companions, the Muses, they sang to the gods on Mount Olympus, and danced to beautiful music that the god Apollo made upon his lyre. The traditional association of the Graces with the arts; like the Muses, they were believed to endow artists and poets with the ability to create beautiful works of art. The Graces were rarely treated as individuals, but always together as a kind of triple embodiment of grace and beauty. Also known in other cultures as the three charities, Faith, Hope & Charity. 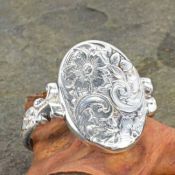 These rings are made with the original hand engraved dies, also known as 'hubs', from a collection dating back from the 1800's to early 1900's. 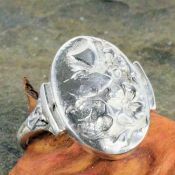 They are not mass produced and are cast per order making these whimsy rings a very unique, personal and one of a kind gift. 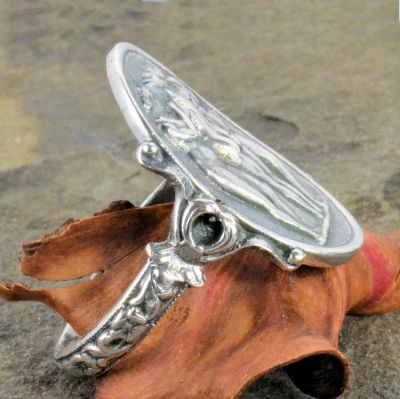 Using a combination of techniques from the past and present these fabulous designs have been brought back to life. 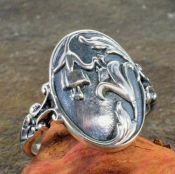 Even the original tool marks hand engraved�over a 100 years ago are left intact and preserved as part of the history and charm of your ring. 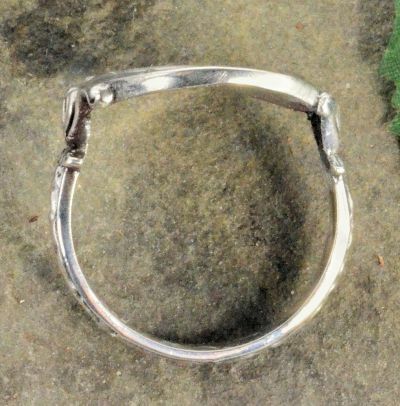 Measurements: Measuring 13/16" by 15/16" wide with a 3.3mm wide band. Manufactured in approx. 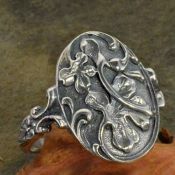 ring size 8 but may vary by as much as 1 size. If you need an exact size select it from the drop down ring size selection box and and our jeweler will expertly re-size. Manufacturing time: Ships in approx. 2 days.